You want to make a deal? You want to play hockey? You want to save a full season? This is what you don't do: If you're the NHL, you don't reject three proposals in minutes and go home in a huff. If you're the NHL Players' Association, you don't offer "three alternative ways to look at this," as executive director Don Fehr put it, and wonder why the other side says you aren't speaking the same language. You especially don't dangle your biggest carrot without thinking it all the way through. "I am, to say the least, thoroughly disappointed," NHL commissioner Gary Bettman told reporters Thursday in Toronto, after talks broke up and the league brass took off for New York. "Today is not a good day," Fehr said. "It should have been, but it wasn't." By now, we should know spin and posturing and scare tactics when we see them, and we should know how quickly things can change. Bettman said he still hoped to play an 82-game season. His deadline remains Oct. 25 to reach a deal so a full season can start Nov. 2. Even if that deadline is not met, the odds remain that there will be some kind of abbreviated season. The sides are too close and have too much to lose. All is not lost. Yet. Yet there is still too much BS – old grudges, negotiating tactics, PR moves – and not enough business, and until that changes, nothing else is going to change. Both sides have now made offers that at least look fair: The owners will split hockey-related revenue 50/50 with the players, while honoring existing contracts, in a way. The players will split HRR 50/50 with the owners, they say, after existing contracts are honored. But of course, neither proposal is as simple as it seems, and neither side will negotiate off the other's proposals, and fair is a subjective term. And so 'round and 'round we go. Again, to be clear, the bulk of the blame belongs to the owners. They locked out the players for an entire season in 2004-05, and they got a salary cap and a 24-percent salary rollback. Now, despite seven years of record revenues, they're locking them out again and asking for more, more, more. They want them to go from 57 percent of HRR to 50, right now, when that represents $231 million a year, if revenues are flat. They want to tighten contracting rules, when loosening them was their concession last time. Their opening offer was too harsh, and now they're being only less harsh, and they're still being stubborn. 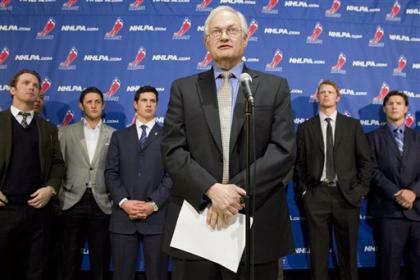 Fehr helpfully reminds us of the 2004-05 background every time he holds a news conference. But again, the players are not blameless victims. They prospered under the last CBA and are better off than ever before. They did so well under the last CBA that they wanted to keep playing under the deal. How are they going to win here? What is their end game? They should not cave just because the owners want them to. They should not take a bad deal just because they are under pressure. But they have to acknowledge that the owners have the hammer – like it or not, as bitter as they are at Bettman, as much as they distrust the owners – and their goal must be to get the best deal they can. They are going to lose in the end; they have to mitigate their loss. Is this the best way to do that? To reach the best deal for everyone, both sides have to make offers the other would reasonably accept – something in line with the other's principles – and they have to do it before too much money is lost and future growth is threatened. Forget the owners' previous offers. Their last offer, at last, at least began to address the players' stance. The players' No. 1 principle has been "no rollback;" the owners came up with the "make whole" provision, making up for money lost on current contracts with deferred payments. The players have been willing to take less of future growth; the owners offered 50 percent of HRR. The players have asked for more revenue sharing; the owners offered $200 million – up from the $140 million from last season, not far from the $240 million the players have proposed. (Funny, you don't hear the players talk so much about that issue anymore, when that was their moral high ground before.) The players have resisted changes in contracting rules; the owners backed off a bit. The players don't like the "make whole" provision, because it comes out of their future share. It's players paying players, not owners paying players. Well, they could have proposed that it come out of the owners' share instead. They didn't. The players could have negotiated descending percentages of HRR – going from, say, 54 down to 50 – which would still increase their pay in the long run based on their projections, which are more optimistic than the league's. They didn't. They could have tweaked the rest of the owners' proposal. They didn't. They just said no, at least according to the NHL. By holding out, the players got the owners to make two straight proposals, to negotiate against themselves, to get about where we thought they were headed all along. Kudos. They created an opportunity. They didn't seize it. They blew it. 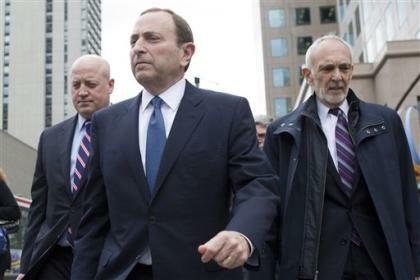 "I view the proposal that was made by the players' association in many ways a step backward," Bettman said. "The proposal that we made, so we can be clear about it, at 50/50 and all the other things, was the best that we could do. We gave it our best shot. It was our best offer. We gave the players' association what we had to give." The players' first two proposals involve a lot of math, but they boil down to this – they depend on future growth. For their percentage of HRR to go down, HRR has to rise a certain amount. For it to approach 50 percent, HRR has to rise a lot. Escalator clauses can keep it from actually reaching 50 percent if HRR rises a ton. That protects what the players have already. It puts all the responsibility and risk on the owners. While that appeals to the players and might be a lockout deterrent in theory – the owners better settle now before they mess up that growth, right? – it doesn't appeal to the owners and ignores the reality that the owners are prepared to cancel games and mess up that growth to get their way. The players' third proposal sounded reasonable. They would split HRR 50/50, as long as the owners honored contracts they've already signed. Who doesn't think that's fair? Who doesn't think the owners should live up to their word? But remember, the players signed those contracts in an escrow system, knowing they might not see every dollar. They could have proposed a cap on escrow. They didn't. They proposed some money be set aside, with the rest split 50/50. The NHL says it is not nearly as good as it looks. "It is not a 50/50 deal," deputy commissioner Bill Daly said in a statement. "It is, most likely a 56- to 57-percent deal in Year 1 and never gets to 50 percent during the proposed five-year term of the agreement. The proposal contemplates paying the players approximately $650 million outside of the players' share. In effect, the union is proposing to change the accounting rules to be able to say '50/50,' when in reality it is not. The union told us that they had not yet 'run the numbers.' We did." That last part is a shot, sure. But the union told the public the same thing. Fehr said the players had just come up with the idea. "We haven't been able to run the numbers yet," Fehr said. Really? What the heck has the union been doing since Sept. 12, the last time it made a proposal? The leaders haven't run the numbers yet on their best-sounding offer so far? What do the rank and file think about that? Did the rank and file press the leadership to make that proposal during that last-minute conference call Thursday? Is that why the negotiating session was delayed? Enough. Enough of the games. Enough of the too-smart solutions and strategies. Enough of the history lectures and economics lessons. Enough of the grudges and the greed. Owners, get back to the table and find more in the players' proposals you can adopt. Players, get off your high horses and find a way to give the owners more of what they want without compromising your principles. Ask yourselves how much is enough, because the rest of us, we already know. We've had enough of all of it.